Over 50 years of experience in thermogravimetric analysis at Netzsch stand behind their latest development: the TG 209 F1 Libra thermobalance. This instrument allows for analyses to be carried out even faster and more accurately than ever before, and across an extended temperature range. 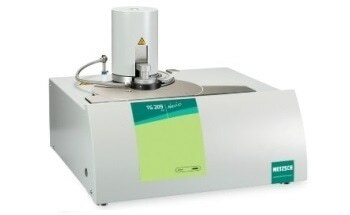 The TG 209 F1 Libra thermobalance from Netzsch. In contrast with other thermobalances, no time-consuming baseline determinations need to be carried out with the TG 209 F1 Libra prior to a measurement. The unique BeFlat function of the Libra automatically compensates for any external factors influencing the measurement. This can cut work hours by up to 50%, leaving more time available for further measurements or other laboratory tasks. 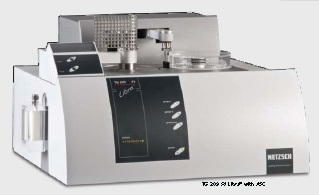 The TG 209 F1 Libra is very well suited for polymer analysis. The calculated DTA signal, c-DTA, yields valuable information on phase transitions. This additional information allows for an unknown sample to be identified and characterized much more easily and precisely. The lifespan of the new ceramic furnace is many times longer than that of conventional thermobalances. The analysis of fluorinated or chlorinated polymers is therefore no problem. The reaction and purge gases cannot condense in the furnace. This prevents occurrence of the dreaded "memory effect". In conventional systems, condensation can distort subsequent measurements. 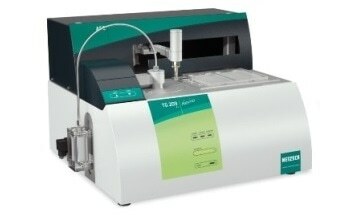 The vacuum-tight design of the TG 209 F1 Libra not only allows for the creation of a pure inert atmosphere via evacuating and filling, but also for the execution of measurements under vacuum conditions. The mass loss steps from the evaporation of the plasticizer and the decomposition of the polymer can be clearly separated. Therefore it becomes possible to characterize the plasticizer content precisely.